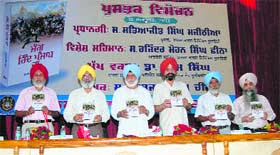 A book on the Anglo-Sikh war, “Jang Hind Punjab Da”, was today launched during a function at Khalsa College here. Written by Ludhiana-based Harbhajjan Singh Cheema, the book is an account of Punjab’s history and wars following Maharaja Ranjit Singh’s demise in 1839 and annexation of the state by the British in 1849. Dharam Singh, former Head of Department of Punjabi Studies, GNDU, said the contemporary sources had been made base for the book and it would encourage further research and studies on the subject. Cheema said it was his humble attempt to write from the perspective of the courageous soldiers. The Khalsa College Governing Council (KCGC) president Satyajit Singh Majithia released the book. He praised the author and said the book was testimony to the rich and brave tradition of Sikh soldiers who fought valiantly giving a formidable challenge to the British. He said the book detailed about the happenings that changed the course of history and how Punjab fell in the hands of the British. The book also highlights the vacuum that had set in following Maharaja Ranjit Singh’s death and how the British were eyeing Punjab for long to set their foot on the land of the five rivers. to hundreds of brave soldiers related to crucial time ahead of Punjab’s annexation.